With an increasing catalogue of directives having been issued since 2010 by the Rt. Hon. 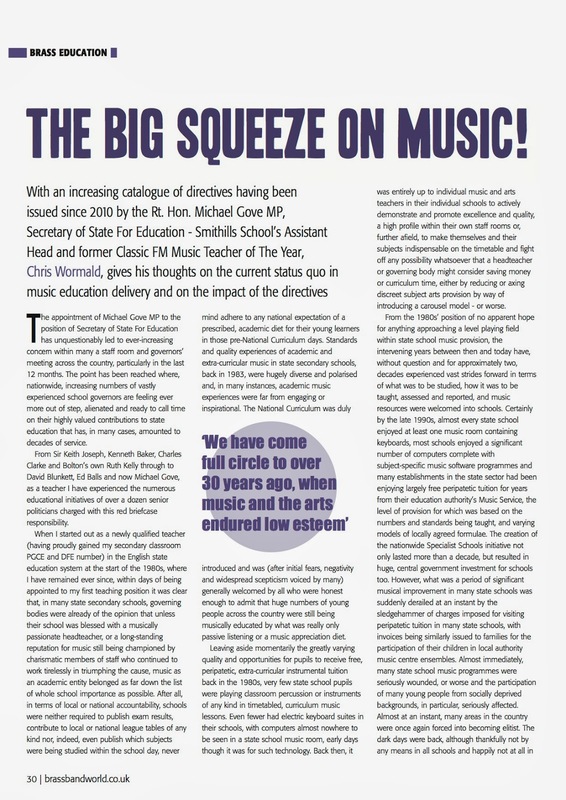 Michael Gove MP, Secretary of State For Education - Smithills School’s Assistant Head and former Classic FM Music Teacher of The Year, Chris Wormald, gives his thoughts on the current status quo in music education delivery and on the impact of the directives. The appointment of Michael Gove MP to the position of Secretary of State For Education has unquestionably led to ever-increasing concern within many a staff room and governors’ meeting across the country, particularly in the last 12 months. The point has been reached where, nationwide, increasing numbers of vastly experienced school governors are feeling ever more out of step, alienated and ready to call time on their highly valued contributions to state education that has, in many cases, amounted to decades of service. From Sir Keith Joseph, Kenneth Baker, Charles Clarke and Bolton’s own Ruth Kelly through to David Blunkett, Ed Balls and now Michael Gove, as a teacher I have experienced the numerous educational initiatives of over a dozen senior politicians charged with this red briefcase responsibility. When I started out as a newly qualified teacher (having proudly gained my secondary classroom PGCE and DFE number) in the English state education system at the start of the 1980s, where I have remained ever since, within days of being appointed to my first teaching position it was clear that, in many state secondary schools, governing bodies were already of the opinion that unless their school was blessed with a musically passionate headteacher, or a long-standing reputation for music still being championed by charismatic members of staff who continued to work tirelessly in triumphing the cause, music as an academic entity belonged as far down the list of whole school importance as possible. After all, in terms of local or national accountability, schools were neither required to publish exam results, contribute to local or national league tables of any kind nor, indeed, even publish which subjects were being studied within the school day, never mind adhere to any national expectation of a prescribed, academic diet for their young learners in those pre-National Curriculum days. Standards and quality experiences of academic and extra-curricular music in state secondary schools, back in 1983, were hugely diverse and polarised and, in many instances, academic music experiences were far from engaging or inspirational. The National Curriculum was duly introduced and was (after initial fears, negativity and widespread scepticism voiced by many) generally welcomed by all who were honest enough to admit that huge numbers of young people across the country were still being musically educated by what was really only passive listening or a music appreciation diet. Want to read more? Simply subscribe to our March edition using the secure PayPal link above. You'll even receive a 25% discount just for applying online!